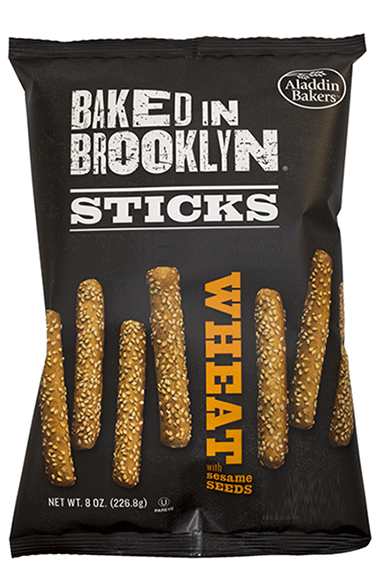 Our Wheat with Sesame Seeds Sticks are made healthy with whole wheat flour and sesame seeds. Then they’re flash-baked at a 450°F for maximum crunch. Try them straight up as a natural, wholesome snack. Or match them with creamy dips, savory spreads or a good schmear. Whole wheat flour, enriched wheat flour (wheat flour, malted barley flour, niacin, reduced iron, thiamine mononitrate, riboflavin, folic acid), water, sesame seeds, contains 2% or less of each of the following: canola oil, salt, yeast, malted barley flour. Contains wheat.